The neighborhood of Hacienda/Del Mesa in Carmel Valley is bordered by Mallorca to the west, and lies east of the Rancho Canada golf course. It is bordered to the south by the Quail Meadows and The Preserve and is accessible by Carmel Valley Road. This very small neighborhood consists of single family homes as well as condos and townhomes. Many have mountain views and the area has convenient proximity to Hwy 1 and Carmel conveniences. Homes are affordable and are part of the excellent Carmel Unified School District. Hacienda Carmel is a condominium complex of 300 residences designed for Seniors aged 55 and over. There are five different floor plans available; Studios, one bedroom one bath, two bedroom one bath, two bedrooms two baths and two bedroom two baths with an oversized living room. There are 150 carports available for those who drive and ample street parking for visitors. Residents are charged a monthly association fee that varies with square footage owned from $474 to $818. These monthly dues cover the full service staff, water and utilities as well as insurance on the buildings and grounds. There is also around the clock security officers to ensure resident’s safety. Housekeeping services can also be provided at an extra charge. There is also a dining room for socializing and meeting new friends and a weekly Sunday brunch. The Del Mesa Carmel condos offer spacious floor plans, with private decks to enjoy peaceful forest and mountain views as well as vistas of the Rancho Canada golf course. Situated on a meadow at the mouth of the Carmel Valley, this 289 unit retirement community is attractively designed and private. The community is protected by security around the clock and is within walking distance to shopping and dining. Residents have access to wonderful amenities including a club house, dining room, and library, and perfect for the active individual there is a fitness center, pool and spa, lawn bowling green, putting green and even a dog park. Living in Del Mesa Carmel gives residents a wealth of activities and recreation to participate in to enhance their lives with a sense of community and friendship. Click here to preview all Carmel Valley homes for sale in the Hacienda/Del Mesa neighborhood. For all available Carmel Valley real estate, click here. In 2018, 3 homes in this neighborhood sold. The most expensive home to sell was a 2 bedroom, 2 bathroom, 1,469 SqFt Del Mesa condominium and selling for 550K. The least expensive home to sell was a 2 bedroom, 2 bathroom condominium located in the Hacienda community with 910 SqFt of living space and selling for 490K. In 2017, 7 homes in this neighborhood sold. The most expensive home that sold, sold for 849,950 for a 2 bedroom, 2 bathroom, 1,750 SqFt, 2-story home in the Del Mesa neighborhood. The least expensive home that sold, sold for 369K for a 1 bedroom, 1 bathroom, 625 SqFt end-unit. In 2016, 7 homes in this neighborhood sold. The most expensive home that sold, sold for 820K for a 2 bedroom, 2 bathroom, 1,480 SqFt home in Del Mesa complete with a separate den/study and deck. The least expensive home sold for 325K for a 1 bedroom/1 bathroom end-unit with 625 SqFt of living space. In 2015, 2 homes sold in this neighborhood. The most expensive home to sell was a bank-owned home in Del Mesa with 2 bedrooms, 2 bathrooms, plus den/study and 1,469 SqFt of living space on a 1,487 SqFt lot sold for 542K. The least expensive home that sold sold for 259K for a studio unit with a fenced patio. 45 homes sold in this neighborhood in 2014. The least expensive home sold for 215K and was a studio townhouse with 515 SqFt. The most expensive sold for 1.075 million for a 4 bedroom, 2.5 bathroom single family home on 1.05 acres. In 2013 there were 61 sales in the neighborhood, the most expensive being a 2,136 SqFt townhome and selling for 1.125 million, with the least expensive being a 515 SqFt townhome which sold for 162K. In 2012 there were 48 sales within the neighborhood, the most expensive home selling for 600K and located in the Del Mesa Carmel complex, this 2 bedroom, 2 bathroom condo had 1,735 SqFt of living space and was situated on a 1,687 SqFt lot. The least expensive home sold was a 515 SqFt studio in the Hacienda Carmel Senior living community which needed updating. Living in the Hacienda/Del Mesa neighborhood affords easy living with a relaxed lifestyle and an abundance of conveniences and resources for Seniors. Though many find the amenities within their communities satisfying, those who want to explore the Monterey Peninsula’s endless recreational activities and events are in a perfectly accessible location to do so. Carmel-by-the-Sea is just a short drive away where you will enjoy a stroll down Ocean Avenue, window shopping and enjoying a fabulous meal in one of the charming restaurants or cafes. Perhaps take your dog for a walk down to Carmel Beach for socializing and the chance to put your toes in the sand. 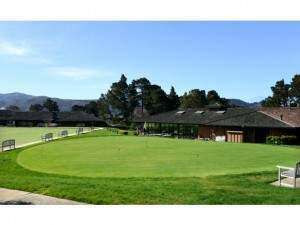 Golfers will want to take advantage of the incredible golf courses in the area particularly the world renowned golfing at one of the seven courses in nearby Pebble Beach. Those with children or grandchildren will delight in their amazement over the abundant birds and sea life and enjoy taking them for bicycle rides in the Carmel sun or a picnic at the beach. Whatever you are in the mood for whether a visit to the art galleries, a game of world class golf or simply relaxing on your deck enjoying the views, your peaceful neighborhood is a wonderful place to call home.